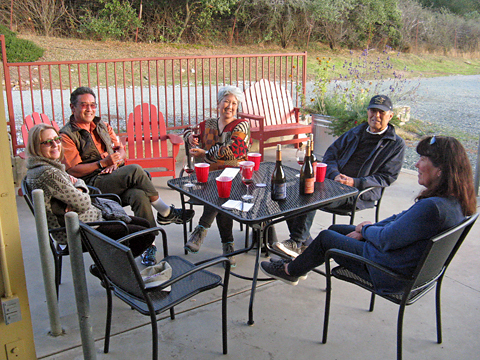 It’s become a late-fall tradition for me to travel to the Sierra Foothills and visit wineries there with friends. It’s usually a one-day trip – a long day for me, coming from the Bay Area, but it’s always an enjoyable outing. I arranged to meet my friends Jane and Chris, who live in Sacramento, on the morning after Thanksgiving. Jane’s cousin Mike and his wife Carol were visiting for the holiday, and they were able to join us as well. 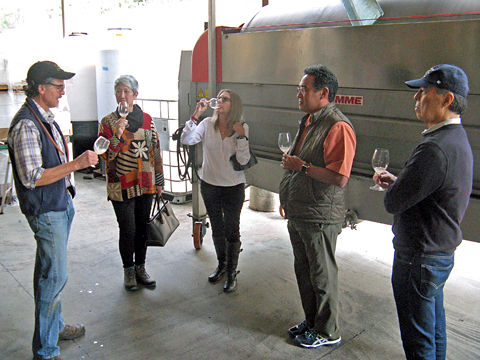 While Jane has been along on a number of my Sierra Foothills wine trips, Chris had only been wine-tasting in the area once, and this would be Mike & Carol’s first time visiting wineries there. While it’s often fun to check out wineries that are new to me, I thought that this time it would be good to stick with some old favorites from the El Dorado County. Chris was the driver for the Sacramento contingent (though Carol and Mike each kept me company by riding along with me for parts of the day) while I drove straight to the Placerville area from Oakland. It turned out to be a perfect day for visiting the Sierra Foothills, mostly sunny, fairly warm, and with almost no wind. We were fortunate that the air was clear enough for the beautiful distant views that you can get from the region. I’d noticed the good air quality as I drove down into the Central Valley on my way east from the Bay Area, spotting the snow-capped peaks of the Sierra Nevada’s Crystal Range and distinctive Pyramid Peak. I had planned to meet my friends in the morning at one of the many apple farms in the Apple Hill area just northeast of Placerville, but I got hung up in traffic a couple of times on the way. And I should have known that Apple Hill would be packed with visitors on the day after Thanksgiving – there were a number of traffic jams along Carson Road, the main route through the area. During this time of year, it’s not only the apple farms that are busy, but the area’s many Christmas tree farms as well – it seemed like every third or fourth car I passed on the road had a tree tied to its roof. My friends had already moved on to a second apple farm by the time I got to Apple Hill, and with all the snarled traffic, I finally gave up on trying to meet them there. 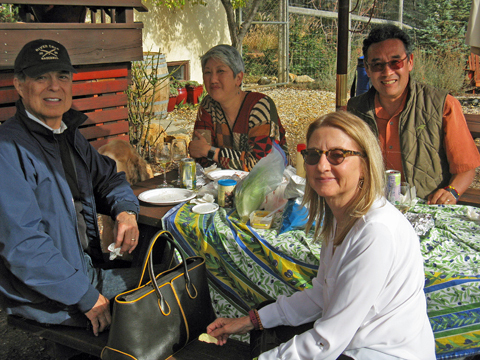 I suggested meeting at Holly’s Hill Vineyards in the Pleasant Valley region, about a 20-minute drive south, and we all arrived there within a few minutes of each other. 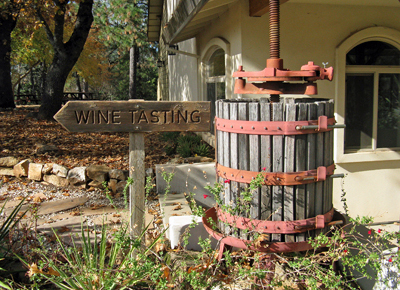 I’ve been to Holly’s Hill many times over the years – specialists in wines made from Rhône grape varieties, I feel that it’s one of the best and most consistent producers in the Sierra Foothills. As I was standing outside waiting for my friends to arrive, Josh Bendick from the winery drove up from the vineyards and happened to see me, and he stopped to say hello. I’ve talked with Josh at the tasting room and at wine events in past years, and he gave me a great tour of Holly’s Hills’ estate vineyards a couple of years ago. Josh shares in the winemaking duties with his wife Carrie in addition to running the tasting room and working on sales and marketing. Josh was busy that day and didn’t have too much time to talk before he headed back out again. Carrie’s parents, winery owners Tom and Holly Cooper, launched the winery in 2001. Tom and Holly’s love of Rhône grape varieties started with a bottle of Châteauneuf-du-Pape they shared on their honeymoon. Carrie earned a degree in Romance Linguistics at the University of Washington, but eventually she turned to working with her parents to make wine at their new venture. She’s worked with and learned from other local winemakers as well as taken courses at UC Davis. Josh also came to the wine business after first studying in a different field at UC Davis. He took an introductory winemaking class there, which led to him changing course in his career preparation. Josh and Carrie met in 1999 while each working for different El Dorado wineries, and they married shortly afterwards and now have three daughters. The first plantings at Holly’s Hill came in 1998, with 15 acres of Syrah vines. More planting started in 2000, and there are now a total of 25 acres planted at the estate vineyard with Grenache Blanc, Picpoul, Roussanne, Viognier, Carignane, Cinsaut, Counoise, Grenache, Mourvèdre, Syrah, and Petite Sirah. The vines are mostly Tablas clone, with Mourvèdre taking up the largest proportion of the estate vineyards, and Cinsaut and Carignane being most recent plantings there. The elevation at the vineyards tops out at about 2,700 feet, with a 200-foot drop down the steep slopes. The soil is mostly of sedimentary and metamorphic origin, and the vines generally do not require much irrigation. Winemaking at Holly’s Hill is straightforward. Whites are all fermented in neutral oak for increased texture, and malolactic fermentation is blocked on most whites – except Roussanne – to retain acidity. All reds are destemmed, and they’re mostly fermented in half-ton bins along with some larger tanks before aging in older barrels. Many of the Holly’s Hill wines are made entirely from estate vineyard fruit, while some include fruit from other nearby sites. My friends and I stepped into the tasting room, which was busy on this day after Thanksgiving. Carrie Bendick was helping out there, and she cleared a small space for the group at one end of the tasting bar. We all started off with the 2016 “Patriarche Blanc,” a blend of Roussanne, Picpoul, Grenache Blanc, and Viognier. Subtle pear and tropical fruit aromas led to a bright but creamy mouthfeel and a slightly chalky mineral note on the finish – this should develop nicely over the next few years. The 2016 Estate Grenache Blanc was the best of this variety that I’ve tried yet from Holly’s Hill, displaying apple, stone fruit, and flowers plus a stony mineral element on the nose, with juicy acidity and a fresh finish. As usual with the winery’s Roussanne, the 2016 Estate Roussanne will need some time to show its best, but it showed potential with its stone fruit, spice, and almond notes and richer mouthfeel. 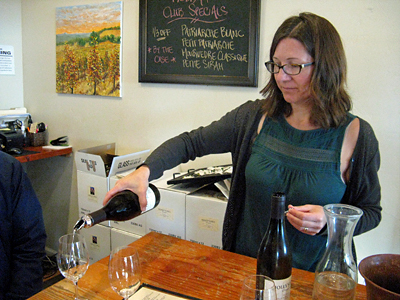 I moved on to reds, and Carrie poured me the 2015 “Patriarche,” the winery’s Mourvèdre-based Rhône blend that also includes Syrah plus a little Grenache and Counoise. This was a standout, featuring meaty and smoky aromas along with earth, darker berry fruit, and herbs. Medium-bodied with moderate grip on the finish, this should be a good candidate for a few years in the cellar. The 2016 “Petit Patriarche” had a larger percentage of Mourvèdre in the blend than in many vintages, with Cinsaut, Petite Sirah, and Grenache in support. In contrast to the “Patriarche,” this was red-fruited, a bit floral, and lighter-bodied. The 2014 Mourvèdre “Classique” was another highlight – it displayed the variety’s characteristic earth, plum, and gamey notes along with touches of iron and spice, with a lively texture and moderate tannins. I finished my tasting with the 2012 Estate “Hill Top” Syrah – aromas of dark berry fruit, spice, smoke, and hints of wet stone and herbs, with fine acidity and a long finish. Holly’s Hill produces quite a few different bottlings, so there were a number of them that I didn’t taste on this occasion. Additional current releases include Viognier, Carignane, Cinsaut, Grenache Noir, Estate Mourvèdre, Petite Sirah, and “Old Vines” Fenaughty Vineyard Syrah, plus a Mourvèdre-Syrah dessert wine and “Midnight Syrah” Port. Already sold out are a Grenache-Cinsaut Rosé, Counoise, and a Dry-Hopped Picpoul. Nearly everything in the line-up is priced in the $22 to $28 range, with the “Patriarche” at $35 – great value for these wines. Holly’s Hill is always a fun place to stop in the Pleasant Valley area, and it was a bonus to be able to talk with Carrie in the tasting room this time. Their white wines are consistently among the best in El Dorado, and the reds are winners too. There were a lot of wines to choose from for tasting, and since I’ve become familiar over the years with the Holly’s Hill wines, I think I picked some of the best the winery has to offer. Favorites included the 2016 “Patriarche Blanc,” 2016 Grenache Blanc, 2015 “Patriarche,” and 2014 Mourvèdre “Classique,” and the 2012 Estate “Hill Top” Syrah was nearly as good. I’ve noted before that the Holly’s Hill wines display a combination of bright acidity with ripe fruit aromas and flavors – a very appealing style. They continue to be one of my favorite El Dorado County wineries and I highly recommend visiting there if you’re in the area. Holly’s Hill is one of the best spots for a picnic in this part of El Dorado County, and we quickly decided to stay there for our lunch. We staked out one of the tables just below the tasting room, overlooking the hillside vineyards and with a distant view to California’s coastal mountains far beyond. Jane and Chris brought Thanksgiving leftovers for putting together some delicious turkey sandwiches, and Mike and Carol bought a bottle of Grenache Blanc at the tasting room to share during our meal. It was no surprise that Drake, the friendly winery dog, joined us as we ate lunch, looking for a handout. We enjoyed the sun and the clear skies, and although it would have been nice to stay and relax for a bit longer, we needed to continue on to our first actual winery appointment of the day. I’ve visited Miraflores several times on my previous wine trips to El Dorado County, but I’d always missed seeing winemaker Marco Cappelli on the days when I stopped there. This time I was in luck! I’d contacted Marco earlier in the week and he responded that he would be at the winery that day, and that my friends and I should stop by for some barrel tasting. I was especially glad that I’d finally be able to meet Marco this time, since he had been amazingly generous in giving me advice via email and phone conversations on making a particular wine in 2015 – more on that below. Marco has been the winemaker at Miraflores since their inaugural vintage in 2003. 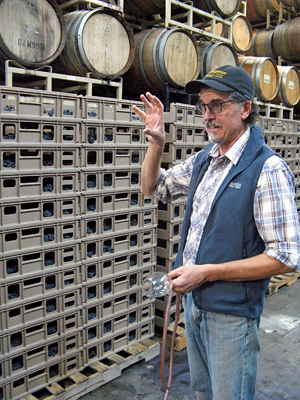 He became interested in winemaking while in college, and earned a degree in enology from UC Davis in 1984. Following this, he gained practical experience working for a year in Italy and six months in France before returning to California, taking a position at Saintsbury Winery in Carneros. There, he met legendary vintner André Tchelistcheff, who soon recommended Marco to Clarke Swanson, who was launching Swanson Vineyards in Napa Valley. Marco became the winemaker at Swanson – working with André Tchelistcheff’s guidance for the first few years – and he stayed there for 17 years before moving to the Sierra Foothills in 2004. He’s made many different wines through the years, but he has gained particular acclaim for his sweet wines and he’s widely-recognized as one of California’s top dessert wine specialists. 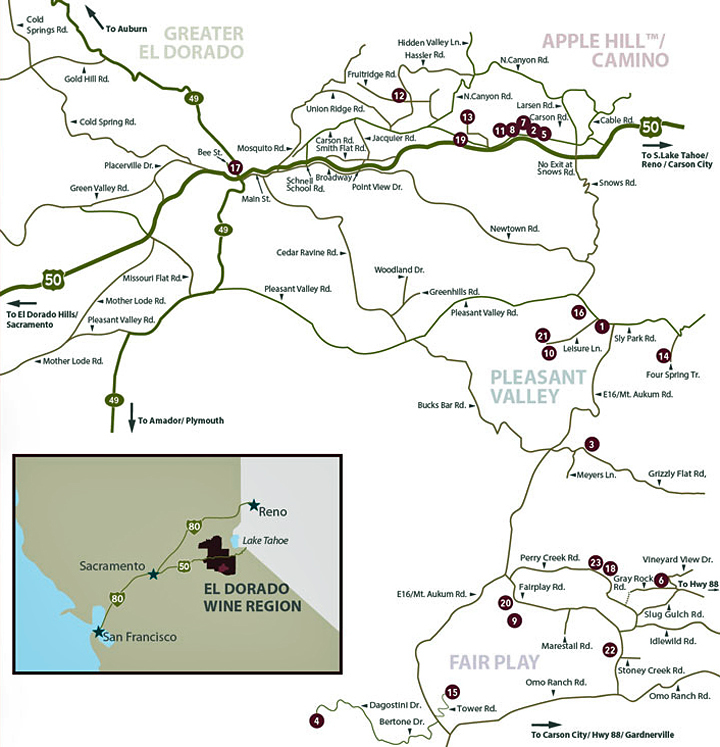 In addition to his work at Miraflores, Marco consults for a number of other Sierra Foothills wineries. Miraflores proprietor Victor Alvarez is a native of Colombia, where his family had a cattle ranch. Now a practicing pathologist in Yuma, Arizona, he purchased the 254-acre site a few miles east of Pleasant Valley in 1995. Just 40 acres are planted, and although there is room for further expansion in the future, the plan is to maintain most of the property in its natural state. Most of the vineyard was planted in 2000-01. Zinfandel and Petite Sirah are the largest plantings, and among the other varieties planted there are Chardonnay, Viognier, Muscat Canelli, Black Muscat, Barbera, Syrah, Mourvèdre, Tempranillo, Cabernet Sauvignon, Cabernet Franc, Malbec, and Petit Verdot. The estate vineyard ranges from about 2,500 feet to nearly 3,000 feet in elevation, and various elevations and exposures were selected for the different grape varieties. Noted El Dorado vineyard manager Rick Wickham, who grew up only a few miles from the winery, oversees the farming at the estate vineyard. Chris and I both parked our cars by the Miraflores tasting room, located on a knoll overlooking part of their vineyard. From there, we walked down the hill to the winery building, where we soon found Marco along with his two young children. Marco welcomed us in, while one of his friends led his two kids up the hill for awhile. The winery was completed in 2007 – I mentioned to Marco that I’d tasted in that building when I first visited Miraflores with friends in 2008, before the current tasting room was finished in 2010. The winery building is fairly large, though the annual production of Miraflores wines is only about 4,000 cases. The balance of the 15-20,000 cases produced each year at the facility are from custom crush clients – Marco estimated that there are over 100 different wines being made at the facility for all the various labels. We followed Marco into a barrel room where he showed us racks of Tempranillo and Barbera grapes being dried to make an Amarone-style wine called “Tintoretto” – I later tried an earlier vintage of this wine back at the tasting room. Marco soon began pulling barrel samples for us to taste, starting with a couple of whites sourced from Indian Rock Vineyard, located just outside the town of Murphys in Calaveras County. Marco makes the Indian Rock Vineyards wines, and we tasted a number of samples destined for their wines, as well as a few for Langman Estate Winery – Marco is also the winemaker for that label. A sample of 2017 Vermentino, being fermented in a neutral barrel, had not yet finished fermentation and had lots of banana and tropical fruit aromas at this stage. A sample of 2017 Pinot Gris from the same vineyard was from a stainless steel tank, and this was more developed and quite nice, with apple and pear fruit and a chalky mineral texture. Moving on to reds, Marco pulled a barrel sample of fresh berry-fruited 2017 Petite Sirah from Indian Rock Vineyard, followed by a very promising 2017 Syrah for Langman. Full of dark fruit, herbs, and black pepper, this was sourced from Baby Rattlesnake Vineyard in the Fair Play region. An herbal 2017 Malbec was next, and then a red-fruited and vibrant 2017 Barbera – both of those also for Langman. Marco shifted gears a little with a couple of 2016 barrel samples. We returned to an Indian Rock wine for the 2016 Zinfandel from Cappelli Ranch. Marco bought that vineyard in 2002 – it was planted in the 1970s and is still labeled by some producers under its original name of Herbert Vineyard. This attractive darker-fruited and spicy Zin was co-fermented with 12% Petite Sirah. An earthy, plummy, and smoky 2016 Tempranillo sourced from Penn Valley in Nevada County, farther north in the Sierra Foothills, completed our barrel samples of dry wines. Marco asked whether we would like to try some sweet wines – that was an easy decision for us to make! As mentioned above, Marco is especially noted for this type of wine. He told us that he likes making dessert wines because it’s fairly easy to do – though having made a couple of them myself, I’m not so sure that’s the case! We started with a real stunner – a 20-year old Tawny Port for Indian Rock. This had beautiful nutty and brown sugar aromas, with a rich, concentrated texture that can only come from years of barrel-aging. I mentioned earlier that Marco had helped me greatly when I was planning to make a particular wine in 2015 – a Mission Angelica. Marco is unquestionably the master of making Angelica, a rare and somewhat obscure wine that’s a true California original. Traditionally made from the Mission grape variety – the first Vitis vinifera vines introduced to California – Angelica is fortified to about 18% alcohol with high-proof grape brandy, added before the grapes have even started to ferment or very shortly afterwards. Another tradition is that the wine is then left in barrel for a number of years with minimal topping or racking, allowing it to oxidize, not unlike a Tawny Port. I’d become interested in the historical nature of this wine in California – it was produced here at least as early as the 1830s and quite likely for some time before that – and decided to make an Angelica myself. I contacted Marco and he was extremely helpful in pointing me toward the source of some Mission grapes and in guiding me in the details of making the wine. Knowing my particular interest in Angelica, Marco took us through a fascinating series of Miraflores barrel samples that helped in understanding the aging process that this wine undergoes. We tasted samples of 2017, 2016, 2013, 2006, and a non-vintage blend of Mission Angelica. Three of these were made from Mission grapes from well-known Rinaldi Vineyard in the Fiddletown area of Amador County, with vines that may date back to the 1860s. Even older are the Mission vines that Marco works with from Deaver Vineyard in Amador’s Shenandoah Valley, reputed to have been planted in 1853 – these may well be the oldest continuously-producing winegrape vines in California. Each successive Angelica barrel sample we tasted showed more oxidative Tawny-like character as well as greater concentration, along with brown sugar and caramel aromas and sweet plummy flavors. The non-vintage sample (with an average age of ten years) was my favorite, with the 2006 and 2013 vintages not far behind. Marco uses a solera-type system for the Angelica, with a “mother blend” of older wine used to top up barrels about once a year. One final barrel sample was a 2016 Black Muscat, a variety not often seen in California. Another fortified wine, this displayed intense floral and lychee fruit aromas and sweet flavors, with a more structured mouthfeel than the Mission Angelica samples. This will be bottled much earlier than the Angelica to preserve its fresh and floral character, so it is not allowed to oxidize as with the Angelica. 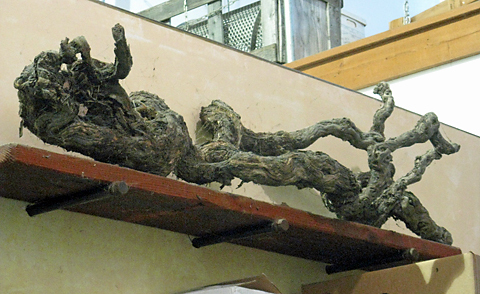 We noticed a huge old Mission vine from Deaver Vineyard on a wall inside the winery. Marco told us that some of the remaining old vines there (still about four acres) are very tall, quite similar to old Mission vines I’ve seen in the Lodi area. We said goodbye to Marco, and walked back up the hill to the tasting room to try a few of the current Miraflores releases there. The tasting room is a handsome Mediterranean-style building that features iron doors crafted in the 1800s, a stone floor, and huge recycled Douglas Fir roof beams that were originally part of the old Oakland Ferry Building, which was demolished in the 1930s. The spacious tasting room was busy on that Friday after Thanksgiving. Miraflores regularly features around 20 wines that are available to taste, so it was tough to choose just a few since we had limited time until our next appointment. I started out with the 2015 Viognier, which was a good choice – ripe stone fruit and citrus with floral overtones and touches of earth and spice, with a rich yet lively texture. The fruit for the 2015 “Misión 1853” was sourced from the old Mission vines at Deaver Vineyard. Very light color for a red – typical of Mission – with red fruit and spice aromas. Next was the 2013 Mourvèdre – earthy and spicy with dark fruit and a touch of leather on the nose. I finished up with the 2012 “Tintoretto” Amarone-style wine – this vintage was made from Syrah, Petite Sirah, and Cabernet Sauvignon, dried on racks for three months before vinification. Ripe and slightly raisiny dark fruit and spice aromas with mildly sweet flavors and a rich texture – a style of wine not often seen in California and quite intriguing. Other wines that Miraflores produces include Pinot Grigio, Chardonnay, Muscat Canelli, Grenache, Syrah, Zinfandel, Malbec, Petite Sirah, Cabernet Sauvignon, Meritage, Barbera, Tempranillo, and more, plus a number of sweet wines, both fortified and botrytis-affected – quite a list! Most of these wines were available for tasting the day of our visit. Prices are very reasonable for the quality, with whites priced at $18-$26, reds mostly around $30, while a few reserve bottlings and the sweet wines are higher. I should note that several of the dessert wines come in distinctive and beautiful bottles, which customers can bring back to the winery to be refilled for a discounted price. This was a particularly memorable visit to Miraflores, as it was great to finally meet Marco and we had a wonderful time tasting barrel samples with him. He’s much younger than you’d expect for someone who’s been a winemaker for as long as he has, and he still has a sort of youthful enthusiasm to his manner. Many of the barrel samples we tasted showed a lot of potential, with favorites including the 2017 Pinot Gris, 2017 Syrah, 2017 Barbera, and 2016 Zinfandel…and just about all of the sweet wines we tried! If I had to choose, I thought the 20-year old Tawny Port, non-vintage Angelica, and 2016 Black Muscat were highlights among these. And though I only had time to taste four of the current Miraflores releases, the 2015 Viognier and 2012 “Tintoretto” were standouts. Miraflores produces a diverse selection of wines, and the best of them are certainly among the finest I’ve tried from El Dorado County – definitely worth a visit there. As is often the case, this Sierra Foothills wine tour ended with a visit to Cedarville Vineyard. 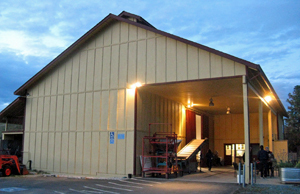 Located a few miles south of the Pleasant Valley region where our earlier winery stops were located, Cedarville is in the Fair Play AVA, in the southern part of El Dorado County. Fair Play boasts the highest average elevation of any AVA in California – the Fair Play Winery Association’s slogan is “Wines with an Altitude.” We headed up the gravel drive from the road and parked near the yellow, barn-like winery structure. We walked inside, where husband-and-wife proprietors Jonathan Lachs and Susan Marks were pouring wine for a few other visitors. Jonathan and Susan met while they were each earning enology degrees at UC Davis, but they both worked for a number of years in Silicon Valley before entering the wine business full-time. They purchased their vineyard site in 1995. There were already vines there – some Syrah and Zinfandel had been planted the previous year – and Jonathan and Susan added more right away. They’ve farmed their 15-acre vineyard organically since 2010 – it’s planted to Viognier, Grenache, Mourvèdre, Syrah, Zinfandel, and Cabernet Sauvignon. 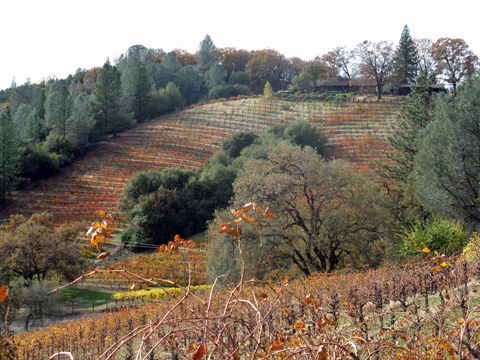 Situated on a hillside at about 2,500-foot elevation, the vineyard features the decomposed granite soil that is characteristic of the Fair Play area and seen in some other parts of El Dorado County but uncommon in most other California wine regions. The first Cedarville releases were from the 1998 vintage, and by 2000 Jonathan and Susan had completed their winery, including two concrete-vaulted barrel rooms extending into the hillside, providing natural cooling. 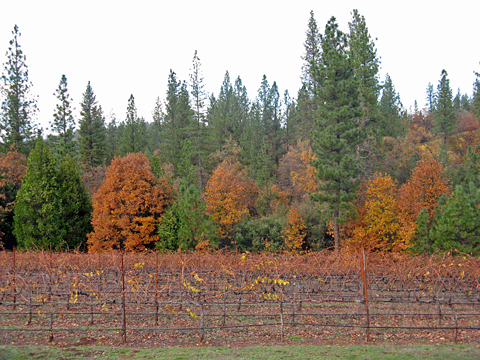 I’d noticed that the vines at Cedarville had already lost most of their leaves – something we’d seen at our two earlier winery stops that day. There are usually plenty of brilliantly-colored fall leaves on the vines when we visit the area at this time of year, though I didn’t think to ask anyone whether they knew why the leaves had dropped earlier this year. Jonathan and Susan did mention that their vines were helped by the rainy winter early this year, and that this was closer to a “normal” growing season than many other recent ones – something we heard from everyone we visited on this trip. In addition to using the fruit from their vineyard for the Cedarville wines, Jonathan and Susan sell some to several other highly-regarded producers, including Turley, Skinner, and La Clarine Farm. 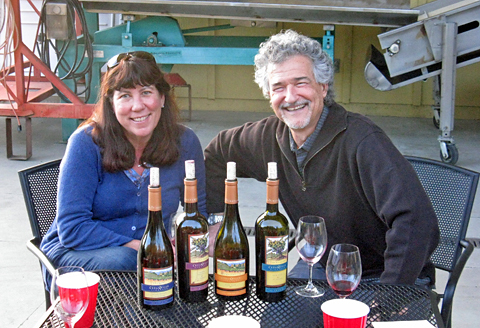 As with many other Sierra Foothills wineries, Cedarville is a small, hands-on operation, and Jonathan and Susan do nearly all of the work themselves during crush. Since most of the fruit for their wines comes from their estate vineyard – the only exception is Petite Sirah from nearby Naylor Vineyard – they’re able to bring it into the winery early in the day. Reds are destemmed but are largely whole-berry, and fermentations take place in small bins or in temperature-controlled stainless steel tanks. Total annual production is currently about 1,200-1,300 cases. With the tasting they were conducting for the other group at the winery starting to wind down, Jonathan and Susan asked whether we would like to taste outside on their crushpad, where they had a couple of tables with chairs set up. That sounded like a fine idea, as the weather was warm enough to make that an enjoyable option – not always the case in late November. While Jonathan finished up the tasting inside the winery with their other visitors, Susan sat down with us and started us out with Cedarville’s lone white wine, the 2016 Viognier. This vintage follows in the path of other recent ones, showing citrus and stone fruit along with touches of spice and flowers, moderately rich yet with the acidity giving it a lively mouthfeel. Susan next poured for us the 2015 Grenache – as usual for Cedarville, this has some Syrah blended in, 14% in this vintage. Ripe red fruit, spice, and a touch of sweet oak on the nose, with a bright, lighter-weight mouthfeel and finish – very much in keeping with the winery’s style for their Grenache, which has become one of their signature wines. We followed this with the 2015 Zinfandel. While Jonathan and Susan have often blended in a bit of Petite Sirah, this one is 100% Zin. Bright cherry and raspberry combined with flowers, spice, and a touch of pepper on the nose, with medium weight on the palate and moderate tannins. The 5% co-fermented Viognier showed in the floral notes of the 2015 Syrah, along with dark berry fruit, black olives, spice, and touches of coffee and vanilla/oak – very tasty now but this should develop nicely in the cellar. Once the other group at the winery had left, Jonathan joined us at the table for the last few wines of our tasting. The Grenache / Syrah / Cabernet Sauvignon blend of the 2014 “Turnabout’s Fair Play” is Cedarville’s homage to the wines of Priorat. Dark fruit, earth, with touches of smoke, leather, spice, and stony minerals made the aromatics quite intriguing, while the bigger structure and firmer tannins suggest that some bottle age will be of benefit – I’ve found that’s generally the case with this wine. The 2015 Naylor Vineyard Petite Sirah continues a run of fine vintages of this wine for Cedarville. I’m usually not a big fan of the variety but this one had beautiful aromas of dark berry fruit, flowers, black pepper, and chocolate, with a rich yet lively mouthfeel and moderate but not aggressive tannins. We finished our tasting with the 2014 “The Rules of Fair Play” – a Zinfandel-based blend that includes 38% Petite Sirah, this also featured ripe dark fruit and chocolate on the nose, but also had touches of red fruit plus lots of spice, and a big, rich texture and finish. The only Cedarville wine we didn’t taste on this visit was the Cabernet Sauvignon – this has been one of the best in the Sierra Foothills. 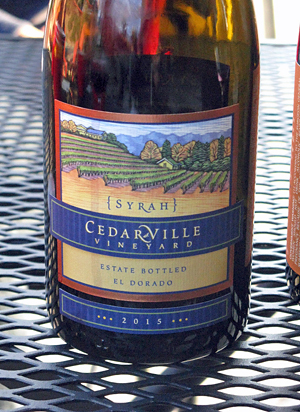 As with many of the best wines from El Dorado County, Cedarville’s are a bargain for the quality – $23 to $29 for most bottles, with three of the them in the $35-$39 range. Unlike the other two wineries I visited on this trip, Cedarville is open for tasting by appointment only. I remember meeting Jonathan and Susan at the Hospice du Rhône event in 2000 and feeling right away that they could make a real impact on the El Dorado wine scene, helping to set the bar higher in terms of quality. While there are more producers in the region who are making excellent wine these days, Cedarville continues to be among the best. My favorites this time were the 2016 Viognier, 2015 Zinfandel, and 2015 Syrah, and I think the 2015 Petite Sirah and 2014 “Turnabout’s Fair Play” just need a bit more time in the cellar to join that group. I’ve noted on several occasions that Cedarville’s wines really benefit from short- to mid-term cellaring, and I believe that will be the case with these latest releases as well. Jonathan and Susan are especially warm and gracious hosts, and visiting them and tasting their wines is always a memorable experience – a stop at Cedarville is highly recommended. We said goodbye to Jonathan and Susan just as it was getting dark, and headed back toward the Placerville area. We’d hoped to eat at Allez! in Diamond Springs but the tiny French bistro was already packed and we were told that there would be a wait of over an hour for a table. None of us wanted to wait around for that long, so we opted to try a place we’d spotted just a few doors down, called Beef ‘N’ Brew. Appropriately, nearly everyone in our group ordered a burger and a beer. The choice of beer on tap is a pretty good one, and my burger was fine but unexceptional. There was a live bluegrassy-style band playing in the restaurant when we were there – the music was pleasant and not too loud. The place was packed by the time we finished our meal so it seems like it’s popular. My first choice in the area is still Allez! – they don’t accept reservations, though, so we’ll have to make an effort to get there earlier next time. If you’re staying in the area, much of their business is take-out, so that could be a good option. Although I often try to pick one or two wineries that are fairly new to me on my Sierra Foothills wine tours, this time I stuck with three tried-and-true producers. I thought this would be a good introduction to the region for my friends who had little or no experience with the wineries from the area, and they all enjoyed the wines we tried from Holly’s Hill, Miraflores, and Cedarville. The focus and style of each of these three are distinct, and they all do a fine job of presenting a line-up of wines that showcase their vineyards and winemaking. A visit to El Dorado County wineries makes for a long and somewhat tiring day for me, but I always enjoy it. There’s an atmosphere that’s truly welcoming there, something that you don’t find nearly as much in other California wine regions these days. And as I found once again, the better producers from the area offer great value for the quality of their wines in comparison to those from many other parts of the state. Along the way on this trip, I heard about a couple of other wineries I’d like to check out the next time I visit El Dorado, so I’m already looking forward to that. As always, thanks to everyone that we visited for being so generous with their time and their wine!